Please see response below from Gail Hillhouse, Senior Management Analyst Supervisor, Office of Procurement and Contract Management, in response to your request relating to Bay Correctional Facility. Please also see documents attached above also in response to your request. This completes your request #14-570. Thank you. All three of your requests have been handled and completed. I sent three emails to you sending attachments. It appears you did not receive them. Please contact me by telephone at (850) 717-3615. If you receive this email from me, then I will forward them again to you using the above email address. Please confirm that you have received this email. Apologies for the inadvertent follow ups and many thanks for your assistance on these and future requests! I'm wondering if there are more documents available in response to this request in addition to the transfer agreements you so kindly provided for Bay, Graceville, and Moore Haven Correctional Facilities. My understanding is that GEO Group took over operation of the aforementioned facilities at the beginning of 2014, so I am hoping also get copies of the Requests for Proposal and the associated contracts. Please see response below from Gail Hillhouse, Operations Manager, Contract Management and Monitoring, in response to your request via email below for more documents. Thank you. As I believe we previously explained to Mr. or Ms. Lipton, the Private Prison contracts were procured through Department of Management Services. The Contract documents can be found of the DFS website at: https://facts.fldfs.com/Search/ContractSearch.aspx. Under this site, click on main link, then the Agency Assigned Contract ID that refers to the DMS numbers (i.e., DMS 08/09-026, DMS 08/09-077, etc.). However, in order to receive a copy of the Request for Proposal, he will have to contact Mike Weber at DMS, Phone Number 850-488-4904 or email Michael.weber@dms.myflorida.com. Thank you for your message. I will follow up with Mr. Weber. "All contracts (and their amendments) and memorandums of understanding entered into by the Florida Department of Corrections for services and activities related to the Bay Correctional Facility (http://www.dc.state.fl.us/facilities/region1/112.html)"
I was able to obtain the original contract (DMS#13/14-009A) through the Department of Management Services website (https://facts.fldfs.com/Search/ContractDetail.aspx?AgencyId=700000&ContractId=PF009&Tab=1). However, I would also like to receive the materials related to the Request for Proposal, all of the exhibits associated with this contract, and all of the attachments encompassed in the understanding of the "Contract" and "Contract Documents" as defined within. Though the contract explicitly mentions Exhibits A, B, D, E, and F, I would like to receive all associated Exhibits. With regard to your request for Exhibits- are you asking for exhibits to the procurement or exhibits to the contract? I believe draft exhibits are available on the Vendor Bid System with regard to the procurement. Thank you for your response and for the relevant links. I would like to obtain all of the materials that were submitted in response to the Invitation to Negotiate, for all bidding parties if possible, and by the winning bidder first and foremost. 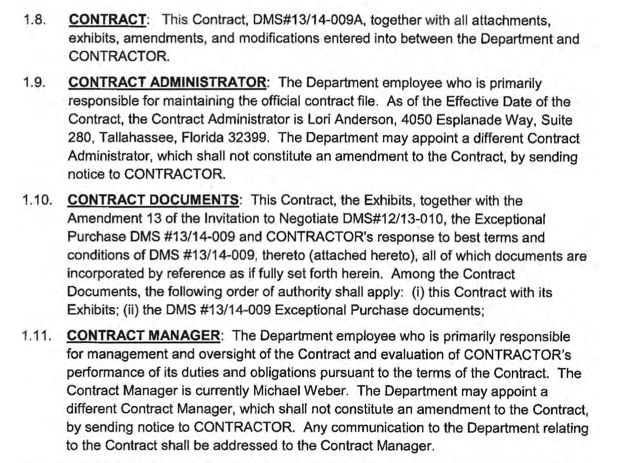 In regards to the exhibits I am requesting, I would like all exhibits associated with the current contract, not simply those referred to in the contract itself (A - Fixtures, Furnishings & Equipment Inventory; B - Transfer Agreement; D - Staffing Pattern; E - Positions, Job Codes and Salaries of the Operations and Management Contract; F - Inmate Programmatic Services Plan). Please let me know if you need any further clarification. I will follow up on each of my requests individually. I’ve received your response and voicemail, as well as the two other emails with public records requests you sent regarding Moore Haven and Graceville. I need to touch base with our private prisons division to see what records we have for everything. I know that at least some of the documents requested have confidential information, so redactions would be necessary. It does look like this might be a large request, for which we would send you a cost estimate before starting. It might make more sense financially to consolidate your three requests into one invoice. I’ll keep you updated as I have more information. Thank you so much for your response. I understand that I'm requesting a considerable amount of material, and I appreciate all of your help very much. I submitted more requests to the Department of Corrections over the weekend, and my assumption is that they will be kicked over to your office for processing. • other available associated documents encompassed within the Contract's definition of "Contract" and "Contract Documents"
• Citrus County Detention Facility (CCA). Please let me know if there's anything I can do to alleviate the stress of search/duplication or if there's any additional clarification that I can provide. I would like to note that I am a media requester and hope that what allowances that may bring will be taken into consideration, though, again, I completely understand that the anticipated number of responsive pages will have its own effect on the eventual invoice. P.S. Each of my requests is associated with a unique email address to help with record keeping on this end, and though it would be a huge help if responsive documents are sent to the appropriate address, I completely understand the unnecessary confusion that it may cause on your end. If that system is too messy, I hope that you will excuse any future inadvertent messages/follow ups that you may receive. I wanted to follow up on the following Freedom of Information request, copied below, and originally submitted on Jan. 4, 2015. Please let me know when I can expect to receive a response, or if further clarification is needed. You had assigned it reference number #14-570.